Some people feel as though they need to put a glass up against a wall in order to get in on what is going on. But the truth is that by actively listening we can learn more than we ever thought possible. 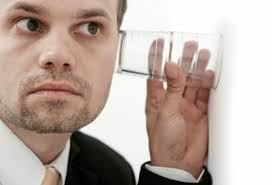 Trying to overhear what someone else is saying can often lead to misunderstandings and false information being passed around. When my daughter was in middle school, she would often come home and talk about her friends in school. She actually had two sets of friends. She had her friends from dancing and then her friends from school. The friends from dance I knew quite well since they had all been dancing together since they were eight years old. Middle school for her was a great awakening to a whole new world. She was making friends with all kinds of different kids, and entering that time when things change as fast as the New England weather. She was always talking about this girl that she had made best friends with. She told me everything about this girl. Where she grew up how many siblings she had etc. My daughter would go on and on and on. I had decided that the best thing to do was just listen. Let’s face it , she and I both knew she did not care a fig about my opinion. Believe me I had an opinion too! It was at that very moment I turned around and recounted every single morsel she had told me about this girl. My daughter’s shocked expression told me everything. It was then I explained to her that while she was talking I WAS actively listening. Just because I was making dinner or doing the dishes did not mean I had not heard every single word. Being a parent of teenagers has taught me skills I can use in the business world as well. Knowing when and where to voice my opinion is one gem. the other is to REALLY listen to what is actually happening without rushing to conclusions.